The Rabbit and Pig compatibility has the potential to grow into a very harmonious relationship. In love and friendship, the rabbit and the pig will suit each other just fine. They will get along well in the day-to-day, but this is also a pairing that will be filled with romance. This is a partnership that will share many common interests as both the rabbit and pig have an affinity for the arts. They will converse about music, artwork, even go to the theatre when the rabbit can coerce the pig out of its home. A quiet picnic in the park after an afternoon at the museum would suit this couple just fine. This Rabbit and Pig relationship will be mutually beneficial. As lovers they will each lift the other up, each wanting to be better for the other. They will be receptive to the other’s needs and respectful of the other’s hopes and desires. Both these Chinese zodiac signs are on a constant search for the truth and the look for the same traits in those they surround themselves with. The rabbit and pig in love share enough similarities and enough slight opposites to pick the other up where they might falter. To the female rabbit, or really any Chinese animal sign in general, the male pig is the epitome of ideal soulmate. The pig man is a stand-up partner, generous in its love, honest, and physically demonstrative of its love for its mate. This is the partner that will sneak kisses, buy flowers and cook dinner for the one that has its heart. They will go to the moon and back for the one it loves. And it’s these little things that will coax the rabbit out of its hole, making it realize that, although it’s afraid to commit, the pig is a keeper that it shouldn’t let him or her get away. Not only does the pig convince the rabbit woman to come out of its shell in love, but with its emotions, as well. They are sensitive souls, upfront and open with their feelings. There are people who wear their heart on their sleeve and encourages the same from their partners. The rabbit man will take note of this and open up, slowly, but surely. The pig woman will also find a responsive partner in the male rabbit, who will eagerly listen and offer advice to the emotional female pig. Yet, the Rabbit and Pig soulmates must be careful to not let their emotions get the best of them, or in the rabbit’s case, its lack of emotion. At times the rabbit may find the pig overly susceptible to its emotions, as they can be very sensitive and often take too much to heart. Even in bed the Rabbit Pig love compatibility will be most sexually satisfying. Yet the rabbit can also understand part of this, as it does take much seriously. Instead, they just choose not to show it, burying it to avoid conflict. Although this shouldn’t be too much of a problem as the pig is usually a pretty happy and content partner, so long as it is appreciated. A breakup will never happen in reality, foretell the Chinese astrology compatibility predictions. There will be few road humps for the rabbit and pig marriage compatibility. This is a relationship based on similar interests and much mutual understanding. The rabbit is keen enough to not take advantage of the pig’s good nature and the pig is tolerant enough to let the rabbit come around. Their relationship will not be forced, instead it will develop naturally, much due to each member’s own personal brand of shyness. The rabbit is shy emotionally and the pig in its persona. And this Rabbit and Pig compatibility will only grow to bring out the best in both. 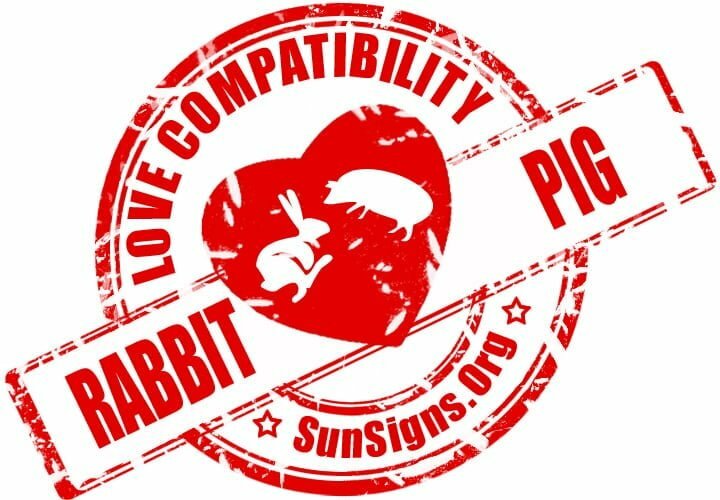 Rabbit & Pig Chinese Horoscope Compatibility Rated 4 Hearts!